When David killed Goliath, the initial giant, there was an entire chapter devoted to this triumphant event. However, in this story, the Israelites defeated a whole handful of giants, and yet, this event is only glossed over. Why is that? Why do they not celebrate these victories over the giants and just mention them in passing by? Isn’t this something that happens at church, too? Don’t we sometimes forget to celebrate the triumphant event of salvations and instead, just gloss over these “giants”? And yet, how many other churches dream about seeing these “giants” conquered? This is just a little side thought that may be worth considering. 1. The battles against giants that we as leaders face and kill, lead our brothers and sisters to a place where they can slay those same giants. It was a phenomenal accomplishment when David killed Goliath. And it also was phenomenal, when the above-mentioned Israelites killed their giants. However, because David already had killed Goliath and thus led the way, it opened the door for them to walk through and defeat their giants. How great is it that one of David’s brothers was amongst those giant-slayers! We, as a church, are brothers and sisters, and when one and each of every one of us face our giants, it encourages another person to face and overcome that exact same giant in their own life. Could it be that the way we overcome as a church together is by the testimony of each and every one of us slaying our own giants? And as we share that testimony of how we slayed that giant, we enable someone else who is following us to kill a giant, that is similar to ours in their own way. Doesn’t that show once again how important we are to one another? Not one of us is an island, and we need each other desperately. 2. The victory we walk in, is supposed to lead to the same victory for our brothers and sisters. I want to elevate God’s view of us. Not to an unhealthy proportion, but to a platform from which we can recognize that the giant God allows us to face is not just for you or for me. This giant is supposed to, and destined to die. And that “giant-slaying” is supposed to, and destined to, become a story, which will then transform into a testimony, which then in turn will encourage others to go out and do the same, as well as advance God’s kingdom. This is even more so the case, when the giant you overcame is ministry related. 3. Every personal giant we face is therefore an opportunity to take ground for our brothers and sisters. What giants are you facing? One reason, as to why David and the others were able to kill their giants, was because it was in their DNA. Goliath wasn’t the first giant. In Genesis 6 and Numbers 13:25-33, we read about the sons of Anak (also known as the Nephilim), who were giants. The above-mentioned giants most likely were their descendants. When the Israelites went and conquered the Promised Land, they slayed those giants, and that “giant slaying” set in their DNA and became part of who they were and of all of those who were yet to follow. Isn’t it the same for us? Because of Christ, who has gone before us and won the victory upon the cross, we are now giant slayers. Maybe you have been beaten by every giant you ever have had to face. But take heart and take comfort from those who have walked before you, and, who have faced and defeated their own giants. These stories serve as a reminder of God’s provision, protection and presence in our lives. 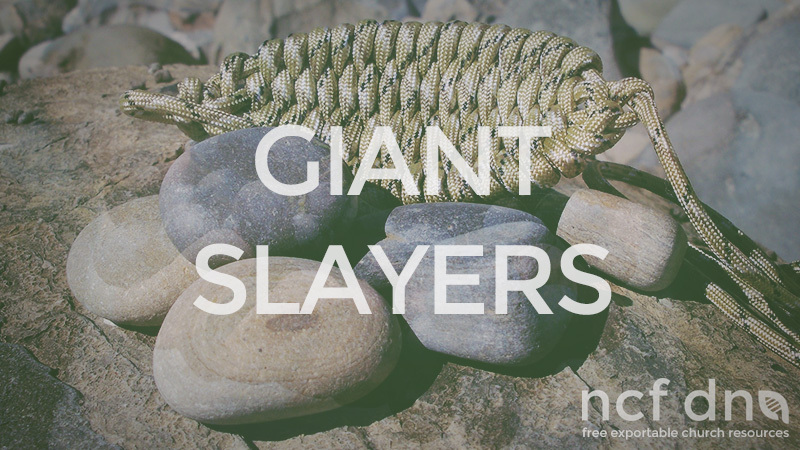 They serve to encourage and inspire others and us, that we, too, are giant slayers. So, from now on, let’s not feel like underdogs, afraid of facing those giants. Let’s remember who and whose we are. Let’s feel sorry for those giants we are about to face. For it is in our DNA. We are supposed to and destined to kill giants. We are giant slayers. For more information, or to go deeper, Malcolm Gladwell gave a fantastic speech on “The unheard story of David and Goliath” which offers a refreshing new view on the well-known and loved story. Here is the link to the 15- minute youtube clip. -staff notes by Aiden Whitaker, compiled by S. Mahabeer.